What is rose rust? Rose rust is a common fungal disease found in much of North America (including the continental United States) and Europe. Rose rust affects many varieties of rose, though some varieties (e.g., hybrids) are more prone to the disease. Rose rust has been a perennial problem along the Pacific Coast of the United States where mild temperatures and high moisture are favorable for rust development. In the Midwest, extremes in winter and summer temperatures have tended to be less favorable for the disease. However, recent climate changes in the Midwest may lead to rose rust becoming more commonplace in the future. What does rose rust look like? Rose rust often first appears on lower leaves, but eventually an entire plant can be affected. Typical symptoms include general yellowing of leaves followed by eventual leaf death. Affected rose stems (i.e., canes) can become curled and distorted. 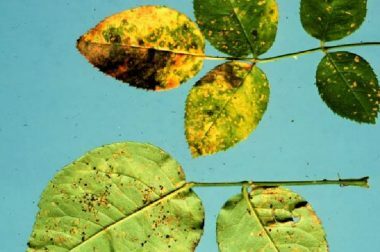 As the disease progresses, powdery orange or black, circular spots (called pustules) containing spores of the fungus that causes the disease form on the undersides of leaves, with corresponding yellow spots visible on upper leaf surfaces. Pustules may also form on stems and green flower parts (sepals). Rose rust usually develops in the spring and fall (when favorable mild temperatures and wet conditions are more common), but the disease can affect roses during the summer months as well. Where does rose rust come from? Rose rust is caused by several species of fungi in the genus Phragmidium. These fungi specifically infect roses. Rose rust is often introduced into a garden on infected shrubs purchased from a nursery or other rose supplier. 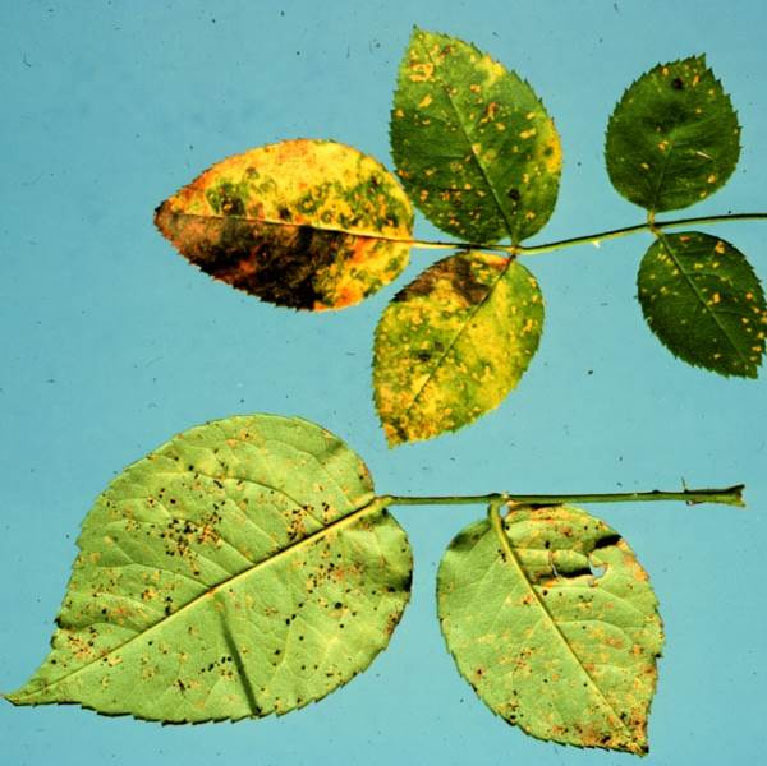 Once introduced into a garden, rose rust fungi can overwinter in rose leaf debris, as well as on infected rose canes. In the spring, spores produced in debris and on canes can blow to newly emerging rose foliage, leading to new infections. How do I save a plant with rose rust? Control of rose rust is difficult once symptoms develop. Prune out affected canes and remove leaves as symptoms develop to prevent the spread of rust fungi to other rose shrubs. Destroy these materials by burning (where allowed by local ordinances) or burying them. In the fall, remove and destroy any remaining dead leaves and other rose debris to eliminate places where rose rust fungi can overwinter. If you notice a rust problem very early (before there are many symptoms), fungicide treatments may be useful for managing the disease; however, most fungicides work best when applied before any symptoms appear. If you decide to use fungicides for rust control, select products that are labeled for use on roses and that contains the active ingredients triforine or myclobutanil. Treat every seven to 10 days, and DO NOT use the same active ingredient for all treatments. Instead, alternate use of the two active ingredients listed above to help minimize potential problems with fungicide-resistant strains of rose rust fungi. Be sure to read and follow all label instructions of the fungicides that you select to ensure that you use these products in the safest and most effective manner possible. How do I avoid problems with rose rust in the future? Whenever possible, plant rose varieties that are less susceptible to rose rust (i.e., avoid hybrid varieties). Always inspect new rose shrubs for rose rust (and other diseases) prior to purchase. DO NOT bring diseased shrubs into your garden. Plant rose shrubs far enough apart so that their foliage does not overlap, and thin your roses on a regular basis. Proper planting and pruning promote good air circulation that will facilitate rapid drying of leaves and canes, thus making the environment less favorable for rust development. Avoid working with your roses when they are wet as you are more likely to spread rust spores under these conditions. Fertilize and water roses appropriately. Well-cared-for plants tend to be less susceptible to disease. When watering, apply water at the base of your shrubs (e.g., with a soaker or drip hose) rather than over the leaves (e.g., with a sprinkler). Watering with a sprinkler tends to spread rust spores and wets leaves and canes, thus providing a more favorable environment for rust infections to occur.